Do I know a lot about Canadian whisky? No, I absolutely don’t and I’ve tasted very little. I just know that you’re allowed to add 9.09% of other alcohol to your whisky and still call it whisky, something that no one else is allowed to do… Like, in the world. These are two pretty impressive releases, one is a well respected younger bottling and the other a seriously old Canadian whisky. Nose: A really nice woodiness, resin and wood glue, the rye is clear with some black pepper, oak too with liquorice and clove, lovely fruit coming out now with fruit gums and powdered sugar, some vanilla custard. 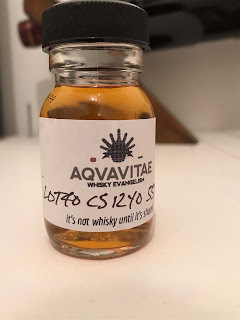 Taste: Soft arrival, really balanced, fruit gums then oak with really good liquorice, some clove, some green peppercorns, more resin and wood glue as it develops. Finish: Long length. More oak here, quite dry with clove and pepper, liquorice. 2017 release. Canadian Rye Whiskey. Many thanks to Roy from Aquavitae for this sample, remember it isn’t whisky until its shared!! Lovely nose and taste on this one but a bit of a let down on the finish. Nose: An old grain whisky, oak and ethereal acetone, old paint stripper, old paint tins. Taste: Sweet start, red apple, grain, cheap leather and then oak oak oak and eventually a sweet hit of orange. Finish: Long length. An old grain here too, oak, orange and a light floral note. Quite a nice long finish. Distilled 1977. 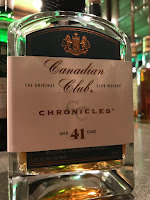 Compared to a 1970's Canadian Club (which was rubbish). Apparently this has been blended with a small amount of Cognac, Rye and Sherry (would those also have to be 41 years old to keep the age statement?) The age is super obvious on this and the whole thing very much reminds me of 40+ year old Scotch grain whisky.